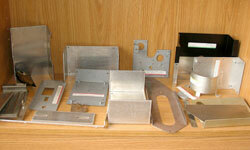 Sheet Metal, Machining, Assemblies, Consoles, Cabinets, Card Cages, Chassis, Machined Castings, Screw Machine Parts: M.D.I. Industries, Inc.
MDI Industries, Incorporated has been providing precision sheet metal, machining and assemblies to our customers for over 30 years. Whether your needs are commercial or require strict adherence to military specification, our professional personnel can handle the job from prototype to production, using all metals or plastics. MDI Industries, Incorporated is housed in three state-of-the-art facilities. Both our original 10,000 square foot corporate headquarter facility in Dear Park, New York, and our two 5000 square foot production facilities are fully computerized for design and manufacturing (see our facilities list). We take pride in maintaining the highest level of quality workmanship at competitive prices. Our technical staff is also available to assist you with design and engineering services, with full CAD/CAM capabilities. Our staff is very sensitive to our customers needs. The sales and management personnel understand the concerns and challenges that face today's electromechanical buyers. As pervious buyers ourselves, we know what's important to you. From sales and manufacturing, to customer service, each member of MDI Industries team recognizes the significance of service, quality, and price. You can depend on our word.